Happy 2017 everyone! Hope you all had a great time relaxing, celebrating and spending time with loved ones during the holidays. I'm so excited about the new year and what sewing projects I will take on. 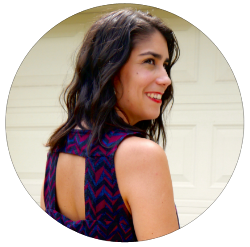 I have some new sewing goals that I hope to conquer and I'm looking forward to sharing them with you and styling them with my current wardrobe. My closet is slowly but surely getting more handmade garments incorporated. I can't believe it! Yay!! 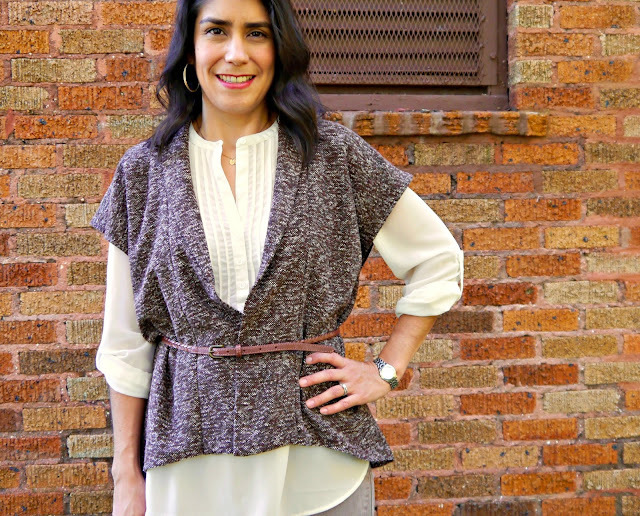 For this post, I want to share this pretty and easy-to-sew sweater vest that I made a couple months ago. I picked this pattern because I love that it's a great layering piece. 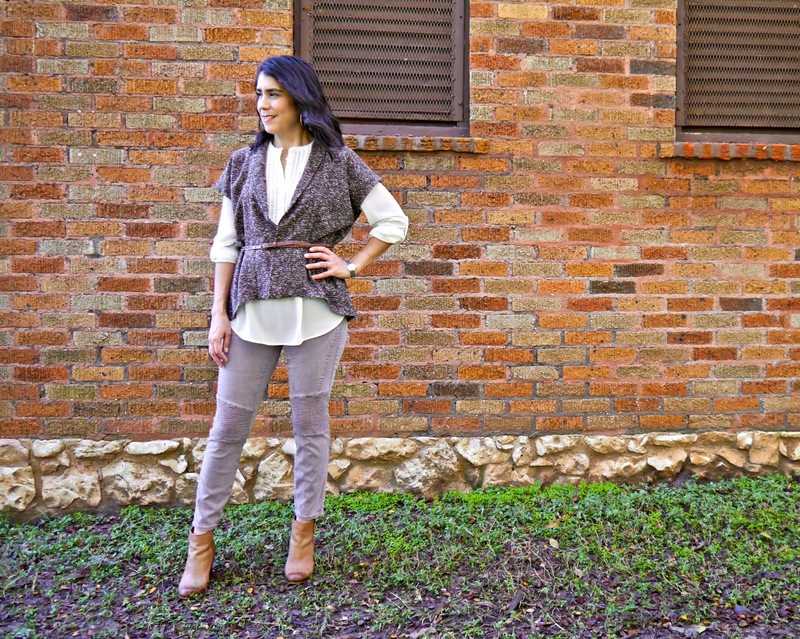 In Texas, our winters tend to be mild and therefore layers are really functional. This pattern is from New Look 6397, it was my first time sewing something from this pattern line. I chose View C since it looked like the simplest one to make. The fabric I chose is a thin acrylic sweater type material that is dark brown speckled with white, and there are also different colored shimmering thread woven in. I love it. It has a boho vibe with a bit of glam. As I've said, this was very easy to sew and would be great for a beginner. My sweater material has some stretch so I used a stretch stitch and serged all of the seam allowances. I also love how the collar is folds out from the neck facing. I styled this vest with a semi-shear cream top underneath and dusty rose denim pants that have a moto detail (my husband loving calls them my Star Trek pants). 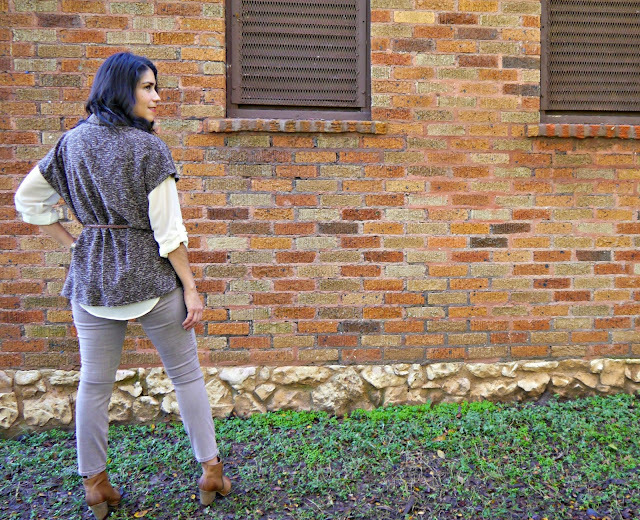 I belted the vest with a thin woven brown belt and finished with my favorite brown booties. I think this vest could also be dressed more casual with a graphic tee underneath and distress jeans. So many possibilities!